You may have been drinking beer for years...this, however, may be the first time you truly evaluate it from a comparative perspective. You are embarking on a sensory expedition, one that encompasses your auditory appreciation, visual perception, olfactory impressions, gustatory consciousness, and kinesthetic faculties. Your brain has the great challenge of merging these sensations into an overall billet-doux, or sweet note, to hold within its memory. The visual sense is immediately awakened by the sight of the tap, bottle, or glass in which it is served. Observing beer as it charges out of a tap can elicit seductive stimulation as it glides into a tall pilsner, the billowy tan head forming tight bubbles as the glass becomes more upright. This sight can actually activate salivation. A grolsch bottle with hinged cap activates thoughts of ease and casualness that aid in the anticipation of a promising flavor profile. Poured with flourish into a flute, swirls of amber-ruby dip with ethereal abandon beneath waves of cream, while your eyes deliver thoughts of chic delight to your brain. Common guerilla-marketing has categorized champagne as a drink of the social elite, while beer has been unjustly tossed into the cellar. Fortunately, the cellar is an ideal atmosphere for the crafting of a classic brew, especially one that has been cave-aged in oak or groomed with multiple layers of hopping and fermentation. You may find this style of craft beer in a 750 ml bottle with cage and cork, worthy to be served in a gold-rimmed chalice. Naturally, your gustatory expectation leaps to a much higher level. You begin to feel that the marketing industry has cheated you – that they have been keeping the most seductive side of beer in an ivory tower, afraid of the tsunami-of-pleasure that would be released, should the secret get out. As you look upon the lovely sight of a stylish beer through clear glass, note the clarity. A wheat beer will usually have a misty glow to it, like a sunrise over the ocean on a hazy morning. 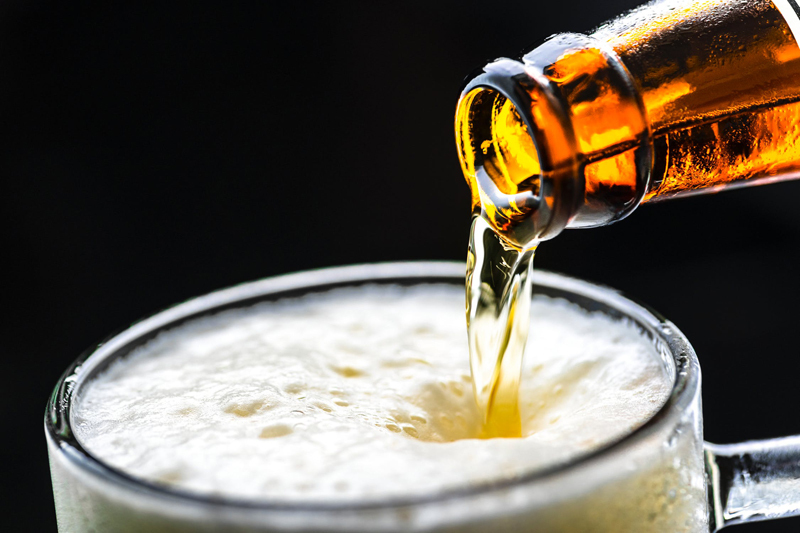 Belgian bottle-conditioned ale will be alive with miniscule particles of yeast that are high in vitamin B, a built-in antidote for the common hangover. Kölsch or pilsner will sparkle with clarity like 18K gold. An imperial stout may conjure up thoughts of a moonless night with its dense, ebony tone. Examine the size of the head, as well as the structure of the cells. How do the bubbles behave? Is the head tight and creamy-tan, white and rocky, or effervescently light, dissipating to a thin ring? Does it lay a coating of intricate Belgian lace on the glass? Some beers, like lambics or meads, have little to no head. If you experience disappointment in retaining head, it may be due to soapy residue in the glass, oils on your lips, or malfunction of storage or dispensing equipment. A layering of Belgian lace is a sign of a well-crafted beer, as well as the cleanliness of the glass in which it is served. Be attentive to the color – the characteristic that imparts distinction to a signature beer. This is where beer shows its personality - the light straw of a witbier, the ruby-amber of a red ale, or the deep mahogany tones of a bock or an oatmeal stout. Your visual assessment clarifies the need for a clear glass, and magnifies the importance of the style of glass in which it is served. You will also benefit by being in a room with white walls, natural lighting and white tablecloth. A mini-flashlight may help for observing the clarity and color. After you have made your observations on appearance, write them down on a scoresheet. Decide whether you interpret these as epicurean delights, and assign numbers to each beer based on your observations. You are now ready to move to step two: Aroma.